A readable and entertaining history in words and pictures of a southern institution that became one of the nation's leading airlines. Drawing on exclusive access to Piedmont's files, the book traces the antecedents of the airline before World War II and documents its growth over the ensuing decades into an international carrier. Happy Birthday from JetPI & The PAHS! On a cold day in February, 1948, a small DC-3 took to the skies over Wilmington, North Carolina enroute to Cincinnati, Ohio with intermediate stops in Southern Pines, Charlotte and Ashville, North Carolina, Tri-Cities, Tennessee and Lexington, Kentucky. Piedmont Flight 41 was carrying one paying passenger, founder T.H. Davis who was not yet 30 years old and a handful of local dignitaries. From this humble beginning, Piedmont Airlines grew from the smallest of 17 local and trunk airlines to become the 6th largest airline in the United States in terms of passengers carried, flying over 200 jet aircraft from Los Angeles to London and more revenue passengers annually than British Airways, Pan Am or TWA while consistently placing in the Top 3 U.S. flag carriers with the fewest passenger complaints according to the U.S. Department of Transportation. 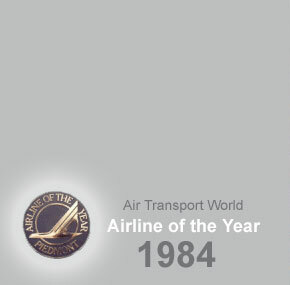 In recognition of its outstanding success, Piedmont was named Air Transport Worlds' "Airline of the Year" in 1984. August 5th, 2017, marked the 28th anniversary of the merger with US Airways (formerly USAir) and the end of scheduled operations as Piedmont Airlines. On September 27, 2005, US Airways was purchased in bankruptcy by America West Airlines. A merger of the two airlines' FAA operating certificates occurred on September 25, 2007 (the US Airways certificate survived), ending the 24-year history of the America West Airlines name. On December 09, 2013, US Airways and American Airlines merge to form American Airlines Group, operating today as the NEW AMERICAN AIRLINES since October 16, 2015. While the "Route of the Pacemaker" no longer exists, the spirit of Piedmont that came to life on that fateful day in February, 1948 lives on in the men and women who served our customers with that "Piedmont know how"! don't be too impressed. That turtle didn't get there by itself." A big thanks to the NC Transportation Museum for hosting Tuesday's celebration. They also put together this video of the event. What a wonderful Piedmont gathering it was! Enjoy! The Piedmont Aviation Historical Society is proud to announce the creation of The Tom Davis Memorial Flight Training Scholarship at Embry-Riddle Aeronautical University in honor of Davis by the Tom Davis Fund. The scholarship supports a flight student at $25,000 annually, in an effort to provide a significant financial gift toward a student pilot's flight training. First preference shall be given to a descendant of an employee of Piedmont Aviation, Inc. In the event the first preference is not identified, it will then be awarded to a descendant of US Airways. If those two preferences are not identified, then it will be awarded to a student from North Carolina.